Origin and Habitat: SE Asia: Burma, India, Thailand and Malaysian Peninsula. Occurs in marshy habitats. Background; it is a fast-growing plant that will reach the surface and grow across it if not trimmed regularly. It can also be allowed to float. Moderate to bright; growth will be slower under moderate light. The light intensity has a bearing on the leaf structure as noted under Physical Description. Soft to medium hard (< 15 dGH), slightly acidic to slightly basic (pH 6.5 to 7.5) water, though most authors suggest the plant will do well slightly beyond these ranges. Temperature 23-28C/74-82F; temperature has an effect on the leaf shape as noted Physical Description. With its finely divided [termed pinnate] leaves and light green colour, this ferny-looking stem plant is a nice contrast to other plants in the aquarium. It is sometimes confused with the true fern Ceratopteris thalictroides. The usual common name of this plant is Wisteria, although it is not closely related to the true Wisteria genus. The leaf shape is determined by the temperature and light. At lower temperatures the leaves are smooth-edged and smaller and less pinnate as shown in the second photo above; at higher temperatures and brighter light the leaves will be sharply divided (pinnate) and closer together on the stem as in the first photo. Lower light will also cause the lower leaves to fall off. This species will grow emersed, although it will produce aerial leaves that will be dark green and oval rather than the lacy submersed form; flowers will only appear with emersed growth. The emersed leaves look something like those in the second photo below that shows the leaf form resulting from lower temperatures and less light. Propagation is done by cutting off side shoots and burying the cut ends in the substrate. Leaves and roots will grow from each node on the stem, so be sure there are several nodes on each piece of stem. Three or four stalks can be planted together but as they grow the closeness of the stems will cause the lower leaves to fall off. Planting the stalks individually will maintain a bushier appearance. Cutting off the tip of the stem will cause the stem to branch out quite profusely. The stems should be pruned before they reach the surface as this will cause a change in growth habit. Vegetative reproduction is very high with this species, as roots will emerge from most or all of the stem nodes. 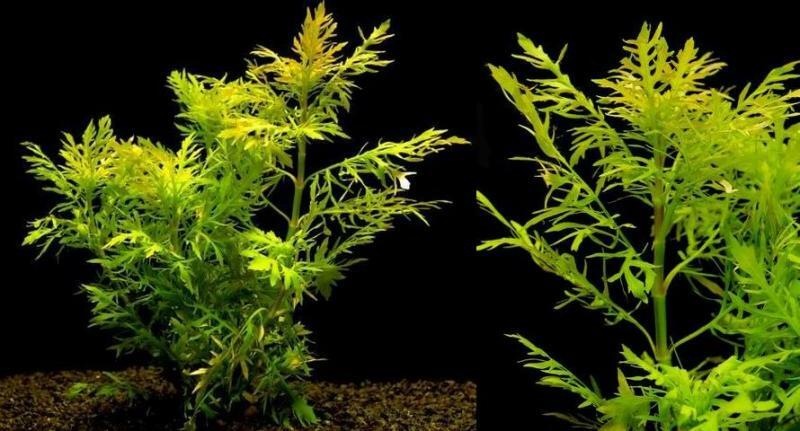 This is an ideal plant for a new aquarium due to its rapid growth requiring the assimilation of nitrogen (as ammonium) and nutrients which also helps combat algae. It is also a good plant for beginners, as it is hardy and easy to cultivate provided it is regularly trimmed. It needs a good source of nutrients, so regular liquid fertilization is beneficial to maintain a healthy plant. It does well in lower (moderate) light though growth will be slower. The Acanthaceae or Acanthus family is large, containing some 250 genera with 2650 species; the various plants are flowering and occur in practically every type of habitat; two genera (Justicia and Hygrophila) contain aquatic species. 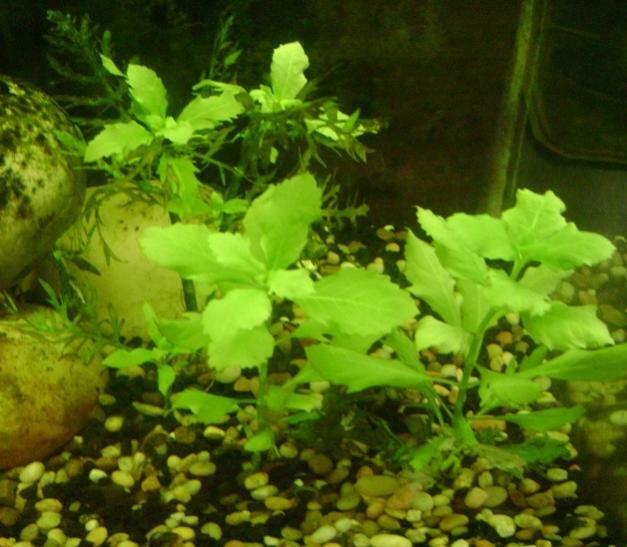 Hygrophila has about 125 species of which roughly 40 are aquatic. Only a few of these are seen in aquaria. This plant was first described as Ruellia difformis in 1781 by Carl Linnaeus, the scientist who devised the biological classification system in use today. It made its way into the genus Synemma (Otto Kuntze, 1891) as Synemma triflorum and is still sometimes seen under this name. The genus Synemma was withdrawn in 1971 by H. Heine and is no longer valid as a distinct genus and its species are now within Hygrophila (Rataj 1977; Kasselmann 2003). The genus name Hygrophila comes from the Greek hygros [moist] and philein [to love] and means moisture-loving; all species in the genus prefer moist conditions and naturally grow in swamps and along streams. The species epithet difformis is Latin for two forms, referring to the submersed and emersed leaf forms. Last edited by Byron; 05-17-2013 at 11:32 AM.